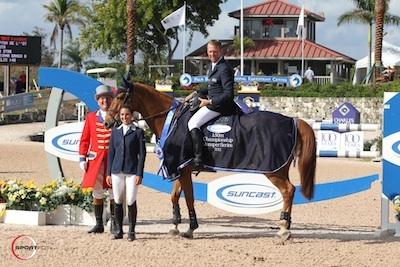 Wellington, FL - February 27, 2011 - The 2011 FTI Winter Equestrian Festival (WEF) concluded its seventh week of competition on Sunday afternoon with an exciting victory for Peter Wylde and Lipton D'Lothain in the $25,000 Suncast 1.50m Championship Jumper Series Classic. Wylde and his mount of six years, owned by Windward Farm and Jessica Siuda, mastered the jump-off course and galloped to the win. This week's course designer in the International Arena was Olaf Petersen Jr. of Germany. Petersen built a fitting course for today's competitors and saw seven of the 49 entries jump clear in the first round. A fall kept one competitor from returning for the short course, but the remaining six riders jumped off to determine top honors. Peter Wylde and Lipton De L'Othain were the fastest of four double clear rounds and stopped the clock in 36.013 seconds for the win. Pablo Barrios and Nathalie Mathers' Costa cleared the course in 37.384 seconds to finish in second place. Nick Skelton and Big Star, owned by Beverly and Gary Widdowson, finished in 37.844 seconds to earn third place, and Sergio Niento Del Rio galloped Fabiana Banco Del Bajio through the timers in 39.124 seconds to place fourth. Enrique Gonzalez and Obelix 148 finished with eight faults to earn fifth place honors and Richard Spooner and Molly Ohrstrom's Billy Bianca incurred eight jumping and four time faults after a refusal to finish in sixth. Commenting on what made the difference in his time, Wylde smiled after the class, stating, "That horse makes the difference; he's like a Ferrari. He is so fast and careful and competitive. He wins many, many classes. I saw Nick go and he was really fast and left strides out and I thought, 'Oh boy, in order to win you've really got to take every risk.' I tried. That's his nature, to win. It makes it fun and easy. He's a brilliant animal and I was lucky he was on form today." Lipton De L'Othain is a 12-year-old Selle Francais gelding by Kashmir Van Schuttershof x Prince Du Logis. "We bought him as a six-year-old," Wylde explained. "We have had him for many years and he's been a winner all of his life. We had a little bit of a slow start at the beginning of circuit, but he is incredibly careful and will almost never knock a jump down. That's why I don't ride him in the biggest grand prix (classes). This level for him is good. Last year he did 18 ROLEX ranking competitions and was in the first three in 15 of them. He has an impressive record. It is not a surprise that he can win a class like this; it's right up his alley." Commenting on the course, Wylde noted, "I thought it was one of the hardest 1.50m tracks we've jumped here. It was quite big and there were some difficult distances. It wasn't far off from an international grand prix." "It's great to win here," he added. "No matter what the class is, to win in Palm Beach is brilliant." Wylde has been based in Germany for seven years, but enjoys the opportunity to compete in Wellington each year. "I hope to be able to come here every winter," he said. "The sport is very exciting here. I have two very good American owners - Jessica Siuda and Windward Farm and Beth Johnson and Louisburg Farm. We all like to be here in the wintertime. As long as it is financially possible and we have good enough horses to come here, we'll make the effort to be here. It is an incredible circuit." Earlier in the day the International Arena held week seven's $10,000 EquiFit High Junior Jumper Classic. With the only clear round in the class, Katie Dinan and Belle Dame D were the winners. 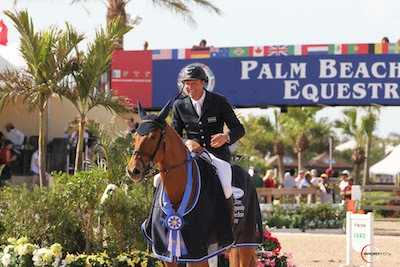 The 2011 FTI Winter Equestrian Festival will continue with its eighth week of competition beginning on Wednesday, March 2. Sponsored by G&C Farm, week eight will feature many exciting classes and is a CSIO rated competition. 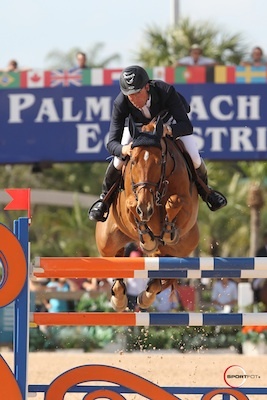 A $5,000 CSIO Welcome Stake will be held on Wednesday and the $31,000 WEF Challenge Cup Round 8 will run on Thursday. Friday will feature a $31,000 G&C Farm 1.45m Classic and the $75,000 FEI Nations Cup presented by G&C Farm. Saturday's schedule includes a $10,000 Speed Stake and a $25,000 ESP Jumper Stake during the day, with the Eventing Pro Cross Derby at 5:30 p.m. and the $35,000 Hermès Puissance. On Sunday the week will conclude with a $25,000 Suncast 1.50m Championship Jumper Series Classic followed by the $150,000 Trump Grand Prix CSIO 4*.